Bead Glass uses an e-commerce system for placing product orders. Orders are placed from a secure (encrypted) page, and are not stored on a web server. Orders are sent to us by email, and a confirmation of the order is sent to the email address entered by the customer. Simply go to our Catalogue area and select the type of product you are looking for from the menu. Products are separated into categories, and within the categories can be viewed by manufacturer or type. Once you have selected the products you wish to order simply click on the 'My Order' button or link to view you shopping trolley, and proceed to the secure ordering area, where you can choose your method of payment and enter your delivery details. Postage and Packaging is calculated by weight. All deliveries are made using Australia Post and approved packaging materials. For more information see our Delivery Information. All prices are in Australian Dollars and include GST (goods and Services Tax) at 10%. 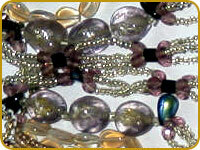 Bead Glass accepts most major Credit Cards, Electronic Funds Transfer (EFT), Cheques and Money Orders. Orders paid for by any other method than credit card will be delivered on receipt of payment.